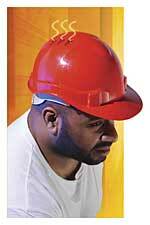 Gateway Safety's new Serpent™ ventilated safety helmet is designed to keep workers cool on the job site while protecting them in harsh work environments. Featuring the CoolSense™ Air Flow System, the helmet has six strategically designed vents along the peak of the head, allowing heat to escape. Additional comfort features include a soft, six-point, impact-absorbing nylon suspension.